Every undefeated team in the NFL obviously is a solid squad, but the Patriots arguably rank as the best of them. Only five teams remain undefeated in the NFL through six weeks of the 2015 season. The Cincinnati Bengals, Denver Broncos and Green Bay Packers are all 6-0, while the Carolina Panthers and New England Patriots are both 5-0. There’s no downplaying Carolina’s come-from-behind win over the Seahawks in Week 6, even if Seattle has suddenly become capable of squandering any lead in the fourth quarter. The Seahawks lost at home for just the third time since drafting Russell Wilson. Still, the Panthers haven’t beat a team with a winning record in 2015. In fact, Carolina’s five opponents have a combined win-loss record of 9-20. The next three games—against Philadelphia, Indianapolis and Green Bay, all at home—will put the Panthers to the test. Get to 8-0 and no one will doubt Cam Newton’s club. The Broncos have scored nine offensive touchdowns and four on defense over six games in 2015. Amazing. Peyton Manning and his dying right arm have 10 interceptions, while the Denver running game is averaging just 3.6 yards per carry. This team could very well be 1-5 or 2-4 if not for its defense, which is fourth in the NFL in points and second in yards and takeaways. Just look at Denver’s six wins. In Week 1, Aqib Talib’s interception for a touchdown put the Broncos in the lead late. A strip of Jamaal Charles set up Denver’s go-ahead score a week later. T.J. Ward’s strip-sack of Teddy Bridgewater halted Minnesota’s final drive in Week 4. Chris Harris stole away a win from the Raiders with a pick-six of Derek Carr in Week 5. And it took a late interception and a huge stand after a Manning pick in overtime for the Broncos to escape Cleveland with a win last Sunday. Defense wins in Denver. The Packers are the only team in the NFL to rank in the top five in scoring offense (27.3, fifth) and defense (16.8, third), and quarterback Aaron Rodgers has 15 touchdowns against just two interceptions. But not all is sunshine and rainbows in Titletown. The Packers are beat up across the board on offense and Philip Rivers just sliced and diced Dom Capers’ secondary for 43 completions and 503 yards in Week 6. Green Bay has also played six teams without a winning record, with four coming at home. We know the Packers are good. But do we know how good? A trip to Denver to play the Broncos after the bye should provide some clarity. The Bengals are an offensive juggernaut, led by unlikely MVP candidate Andy Dalton. The Cincinnati quarterback has 14 touchdowns and two interceptions, with a passer rating of 116.1 (third in the NFL). Through six games, the Bengals are second in total yards and fourth in points per game. The team’s six wins consist of three come-from-behind victories and three blowouts, including two on the road. Cincinnati might be the most balanced team in football, capable of winning in a variety of ways. Still, the Bengals will only go as far as Dalton takes them. The next three games feature a trip to Pittsburgh and back-to-back nationally televised matchups—a nightmare mix for Dalton in the past. The Patriots own the best point differential (+80) of the five remaining unbeaten teams. Yet even with a season-opening win over the Steelers and road victories over the Bills and Colts, it’s still hard to find a defining win for New England. Maybe it will come this week when the 4-1 New York Jets come to town. The Patriots have a way of making winning look so unremarkable, so routine. 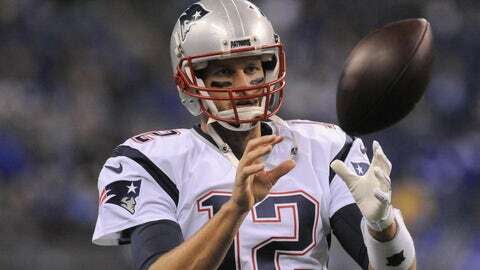 Quarterback Tom Brady leads the NFL in passer rating at 118.4. He’s operating the Patriots offense at 2007 levels. Meanwhile, the New England defense is unspectacular in the stat book but always disruptive. The Patriots probably won’t go undefeated, but there aren’t many teams on the remaining schedule who look capable of matching New England. The best team in football just keeps rolling on.